“This is going to go one of two ways. I’ll either sell out in the first hour or I’ll sell nothing at all.” Those were the words that I uttered as I was beginning to set up for the Pop Up Market at Woodbridge Center. Truth be told, I was exhausted yet strangely filled with energy as I spoke them. On the one hand, I’d been preparing extensively for the past couple weeks for my first event, ordering copies of my own books to sell, getting the supplies I needed such as a folding table and chairs, purchasing craft supplies (more on that later), getting and testing devices so I could accept credit card payments, and working on my website http://www.crosswriter.com, which you should absolutely check out if you are reading this. But on the other hand, it was my first event, and I found it impossible to go into it as exhausted as I felt, so I put on a much more energetic smile. I was enthusiastically ready to sell out, hoping to sell out. After all, there was no way I could sell absolutely nothing at all, right? Well, I didn’t sell out in the first hour – or at all, to be honest. I’m not surprised by that, considering how many books I ordered to make sure I would have enough for the entire event. But I did sell my books, which is something I haven’t done online in some time. I consider this event to be a resounding success. 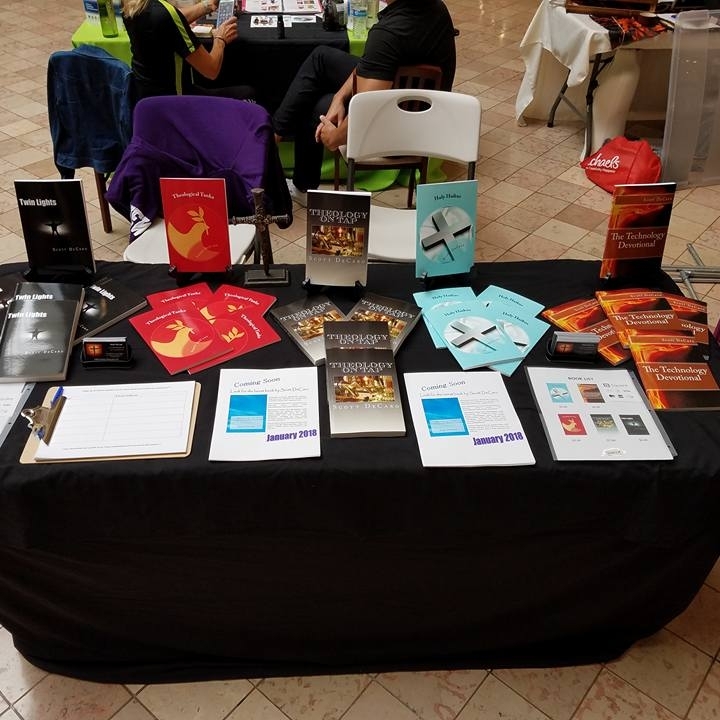 I got my name out there at a mall, with a ton of people walking by my table and noticing my books – even if they didn't buy them then, there is value in people recognizing one's name as an author. In addition, a number of people who didn't buy books took business cards and fliers promoting my next book. And, considering it was my first event selling my books, I got a feel for what it would be like and already have ideas on what to do next time that will help me to sell even more and to further promote myself, something which you might remember I wasn't doing at all prior to this event. All in all, for me this was a wonderful jumping off point, a place to start to get a feel for what will go into future events and a great way for me to begin promoting myself. When the day was over, I left feeling truly more energized than I did when I started, and I’m ready to go to the next one. Having a few complete strangers walk up to me, express interest in and even buy my books... That was an amazing, inspiring feeling. Speaking of inspiration, I mentioned crafting supplies earlier. Why would a writer need those, you ask? Well, a writer does not – but someone who makes crafts would, and my first event really inspired me. Sure, I want to continue writing and selling my books. It's my passion. It's what brought me to the dance, so to speak. But hearing about all the various types of crafts that would be there and then seeing different vendors selling things they'd made with their own hands amazed me. I couldn't believe that most of the people there had crafted such beautiful pieces of clothing, art, and even glassware in their own homes and that it turned out as great as it did. I have to confess that I did not make a profit selling my books because instead I spent any money I made and then some on all sorts of amazing stuff from the other vendors! It all got me wondering if I could make something of my own – the same kind of wondering I did when I considered whether or not I could really tell a story long enough to fill the pages of a book. I know the answer to that question to be yes, but only because I took the initiative, put my pen to the paper, and started to write. So now, having been to my first vendor event, I'm going to put knife to wood and carve some pieces, and see how I do selling those along with my books. Maybe they won't turn out so great. Maybe I'll become a great artist and my books will largely be forgotten. Maybe when I bring those crafts to a vendor event I won't sell much of anything, or maybe I'll sell out in the first hour. Who knows? All I know is I won't know until I try.